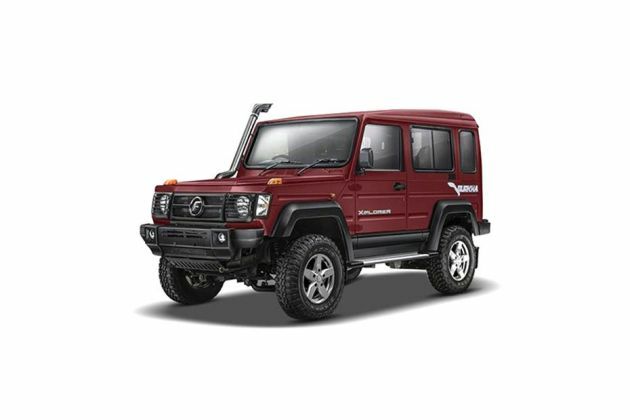 At present, Force Motors is selling only two models, among which Gurkha is their fearsome sports utility model series. It is being sold in quite a few variants, of which, Force Gurkha Soft Top BS3 4WD is the mid range trim. In the Indian car market, it is giving a tough competition to the likes of Mahindra Scorpio, Maruti Gypsy, Premier Rio, Tata Sumo and others in this segments. Under the bonnet, this variant is fitted with a 2.6-litre turbocharged, inter cooled diesel engine, which comes with a displacement capacity of 2596cc. It is compliant with all the norms of Bharat Stage III and incorporated with a common rail based direct injection fuel supply system. It helps in generating a maximum fuel economy of 15 Kmpl approximately on the highways and about 10.5 Kmpl in the city traffic conditions. Its braking and suspension mechanism are quite proficient, which keeps it well balanced on every road. This sports utility vehicle is designed with a large wheelbase along with decent ground clearance, which makes it capable for driving over any terrains. Its handling is made easier with the help of a responsive power assisted steering system that is tilt adjustable as well. It is being sold by the company with a standard warranty of three years or 100000 Kilometers, whichever is earlier. The customers can also avail an extended warranty at an additional cost paid to authorized dealer. To begin with the frontage, it has a bold radiator grille that is fitted with a few black colored horizontal slats and embedded with a prominent company insignia in the center. This grille is flanked by a round shaped headlight cluster, which is incorporated with halogen based lamps and side turn indicator. Just below this, it is fitted with a black colored bumper, which looks quite aggressive. It houses a large air intake section for cooling the powerful engine quickly. This air dam is flanked by a couple of bright fog lamps that adds to the visibility, especially in the bad weather conditions. The front windscreen is made up of toughened glass and is equipped with a pair of intermittent wipers on it. The sides are smooth and flowing with just a single door. Its door handles and outside rear view mirrors are finished in black color and are manually adjustable. The neatly crafted wheel arches have been fitted with a set of modish light weight 16-inch alloy wheels. These rims are further covered with sturdy tubeless radial tyres, which give a superior grip on any terrain. Its rear end gets a large tail gate for easier entry and exit of the passengers. This tail gate is also fitted with a spare wheel, which is a standard feature. Then the bright tail lamp cluster is quite clear and radiant. The black colored bumper is accompanied by a skid plate that helps in preventing the vehicle from damages. It is equipped with a couple of bright reflectors along with a courtesy lamp. The insides are done up quite elegantly and equipped with a lot of refined aspects for the convenience of the passengers. The seats are plush with excellent space for all the passengers even on long drives. These are covered with premium quality upholstery. The plastic surfaces seem to be smooth and are said to be made up of robust plastic, which will further enhance the looks of the insides. Its dashboard is equipped with features like AC vents, a four spoke steering wheel, an instrument cluster and glove box for storing a few things at hand. Its tilt adjustable steering wheel makes it easy to handle even in peak traffic conditions. The front driver and co-passenger also get sun visors and there is also an internal rear view mirror as well along with a center arm rest for the front seats. It also has an advanced instrument cluster houses speedometer, a tripmeter, a tachometer and several other notification and warning lamps. It provides all the vital information to the driver, which will in turn make the drive comfortable and hassle free. Under the bonnet, it is fitted with a 2.6-litre, intercooled diesel engine, which comes with a displacement capacity of 2596cc. It is compliant with a Bharat Stage III emission standard. It comes with a turbocharger, which enables the engine to churn out a maximum power of 80.4bhp at 3200rpm in combination with a peak torque output of 230Nm between 1800 to 2000rpm. It is integrated with four cylinders and sixteen valves using double overhead camshaft based valve configuration. This diesel motor is skilfully coupled with a five speed manual transmission gear box, which distributes the engine power to its four wheels. It can attain a top speed in the range of 130 to 140 Kmph and can cross the speed barrier of 100 Kmph in close to 17 seconds from a standstill. This SUV is bestowed with a dual circuit vacuum assisted hydraulic service brakes that are quite reliable. Its front wheels are fitted with a robust set of disc brakes along with a twin pot caliper and rear ones have a set of drum brakes. This braking system is further augmented by adjusting type LCRV (Load Conscious Regulation Valve) with auto wear adjuster. On the other hand, the company has used an independent with solid torsion bar for its front axle, while the rear one is assembled with a semi elliptical leaf spring type of system. Both these axles are assisted by hydraulic telescopic shock absorbers and anti roll bar. The internal cabin is incorporated with a tubular ladder type based power assisted steering system, which is quite responsive and reduces the efforts of driver during heavy traffic conditions. The list of comfort features include cup and bottle holders, power steering with tilt adjustable function, sleek digital clock with topper pad, side and rear foot step, rear window demister and a few other aspects. It has an advanced instrument panel is equipped with a number of useful information like inside and outside temperature, instant mileage, date and time for keeping the driver updated. The cabin is also equipped with a proficient air conditioning unit with a heater and ventilation. The driver's seat has height adjustment facility, while the second row seat is reclining and comes with 60:40 split folding function. This SUV has a rigid body structure that comes with impact beams and crumple zones for reducing the impact of collision. It is integrated with a digital engine immobilizer that safeguards the vehicle from any unauthorized entry and theft. Then there are seat belts for all occupants, a rear wash and wipe function, a day and night internal rear view mirror, centrally located fuel tank and a high mounted stop lamp. 1. Four wheel drive option enhances its ability to take on any road condition. 2. High ground clearance makes it terrain capable. 1. Lack of essential safety features is a big minus. 4. Exterior appearance needs to improve. Force Gurkha 2013-2017 is available in 3 different colours - Copper Red, Dragon Green, Matt Black.